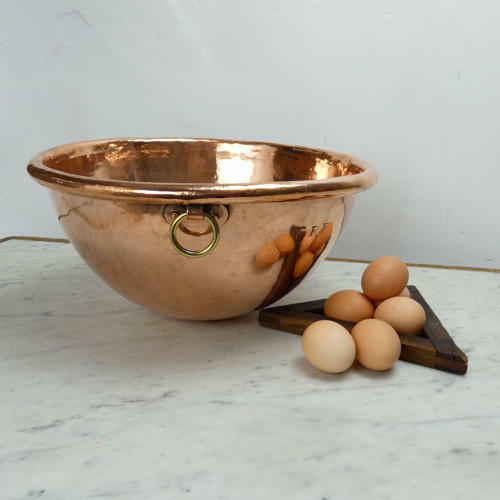 A large, French copper, round bottomed egg bowl. This bowl doesn't have any manufacturers marks but it is engraved with the initials 'W.P.P.' These would have been the initials of a previous owner. It dates from c.1860. It has a heavy brass loop handle to one side, which is attached by a simple copper fitting. The bowl is made from a very heavy gauge of copper, with a very slightly plannished finish, and it has a wired rim. It is in excellent condition.